Publishers' 'Specimen Of First Seven Plates' in 'An Elementary Text-Book of Entomology' by 'W. F. Kirby, of the British Museum'. 16pp., 4to. Unbound and unstitched pamphlet. On aged and worn paper. The first page has the Wesley stamp, and is headed 'Specimen Of First Seven Plates' It also carries nine lines describing the 'object of the author'. The seven plates are accompanied by captions, and there is also an explanation regarding them. [Dilys Powell, journalist and film critic.] 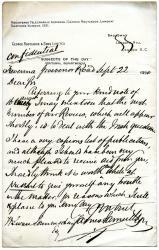 Typed Letter Signed to Robert Swan, declining his 'interesting offer' of 'original portrait drawings' by Swan himself. On letterhead of the Sunday Times, 135 Fleet Street, London. 14 Octobeer 1936. 1p., 4to. On creased and lightly-aged paper, with wear and chipping to edges. She thanks him for his letter 'and for your offer of original potrait drawings by yourself', in which she was 'greatly interested'. She explains that there is a limitation of space, 'and as a general rule we are exhibiting portraits only when we can associate with them some other relic or possession of the writer concerned'. In response to 'our appeal' she has received 'souvenirs of past writers, and I am concentrating on these. This being so, I feel I must very reluctantly decline your interesting offer'. [James Sully, pioneer psychologist.] Three Autograph Letters Signed to the publishers W. Swan Sonnenschein & Co., regarding his editing of a translation of Bernard Perez's 'First three Years of Childhood'. The first letter from The Warren, Crockham Hill, near Edinburgh, 7 May 1884; the second from Holywood House, Hampstead, NW [London], 31 March 1886; the third from Hampstead, 6 April 1886. The three items in good condition, on aged paper. The second letter is addressed to 'Messrs Sonnenschein & Co', and from the context the other two are clearly to the same recipients.ONE: 2pp., 12mo. He states that he would be 'willing to edit Perez's work provided that the translation is well done & that only a general revision of it is necessary', and that he 'could not undertake to correct a faulty piece of work'. He asks the publishers to send him the manuscript, 'so that I may judge, together with a copy of the original', and asks for their terms. 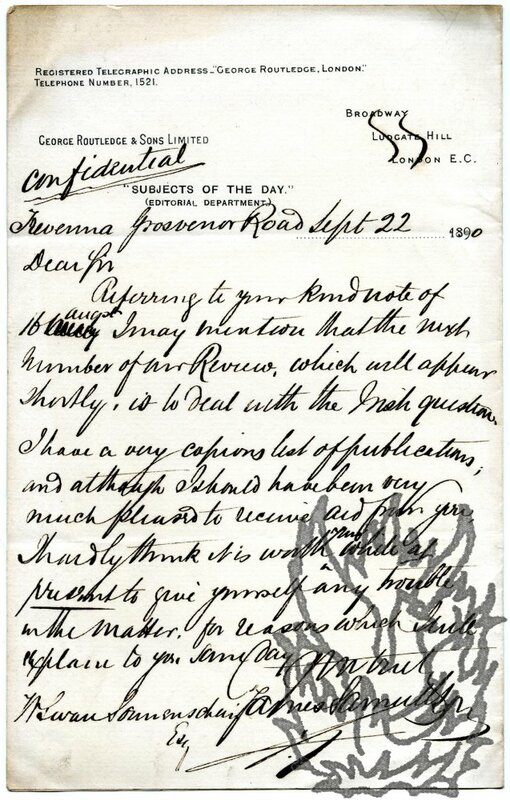 Letter on letterhead of 5 Redcliffe Square, South Kensington, SW10. 28 January 1946. 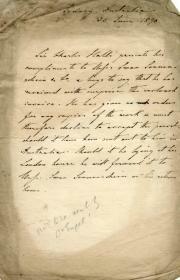 Item One: Autograph Letter Signed from Richter to Swan. 1p., 12mo. In good condition, on lightly spotted paper. From the letter it would appear that in 1946 Richter was acting as one of the selectors for the 59th Exhibition of the Royal Institute of Oil Painters, at the Royal Academy of Arts, Piccadilly, London. He writes that he is enclosing 'the mighty deed [a book, as the letter explains], also the invitation for the exhibition at the Royal Academy valid from Feb. 13 to March 17. Autograph Letter Signed ('E Ray Lankester. | MA. FRS. Professor of Zoology in University Coll. London.') from Sir Edwin Ray Lankester, requesting a copy of Sedgwick's translation of Claus from the publishers [Swan Sonnenschein & Co, London]. 3pp., 12mo. In fair condition, on lightly-aged paper with a thin strip of glue in gutter from previous mounting. Lankester complains that he has 'not received a copy of Mr. Sedgwick's translation of Claus' Handbook of Zoology'. He has 'a large number of students (annually over 60) at University College' to whom he would recommend the book if he had it. 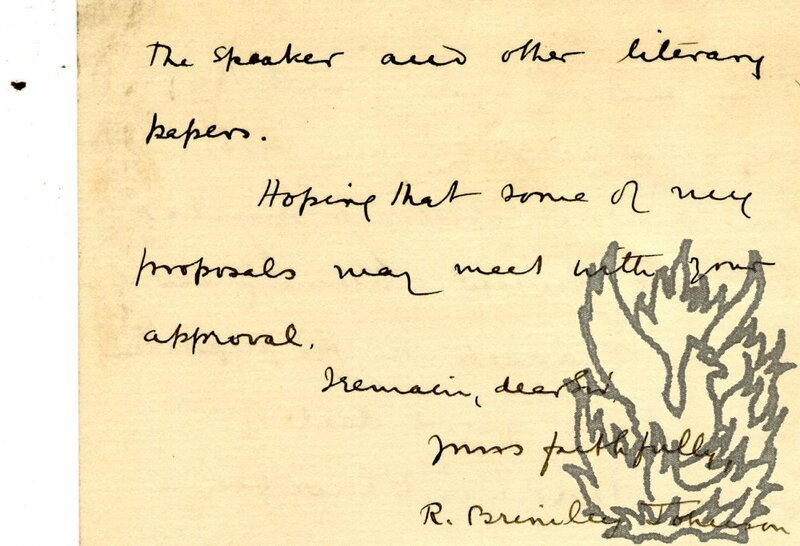 'I should wish to be able to place it on the lecture table for them to see.' He claims that it is 'usual for publishers to enable teachers to do this kind of thing - by sending them copies of works likely to be recommended'. Autograph Letter Signed to Sonnenschein. 8vo, 1 p. Good, on lightly-aged paper. In response to a 'kind note', Samuelson informs Sonnenschein that 'the next number of our Review, which will appear shortly, is to deal with the Irish question'. He has 'a very copious list of publications' and although he would have welcomed Sonnenschein's assistance, he hardly thinks it is worth his while at the present time to trouble himself over the matter, 'for reasons which I will explain to you some day'. Autograph Card Signed ('H C Beeching') to Messrs Swan Sonnenschein & Co., publishers. Plain card, roughly 8.5 x 11 cm. Five lines of text. A little grubby, but good. 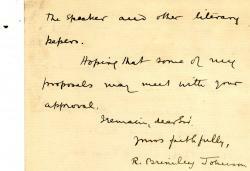 Asking for his manuscript, so that he can 'correct the proof of the Introduction to Crashaw. It was written so many years ago that I can't always recall what I wrote'. Autograph Note Signed "Wm Yarrell" to "E. Charlesworth, The Zool. Soc., Leicester Square". No place, 22 February 1838. One page, 12mo, good condition, laid down on grey paper, through which, with the help of light, the name and address of the correspondent can be discerned. Yarrell says simply: "Herewith I send you the particulars of the new swan - for your minutes and proceedings." 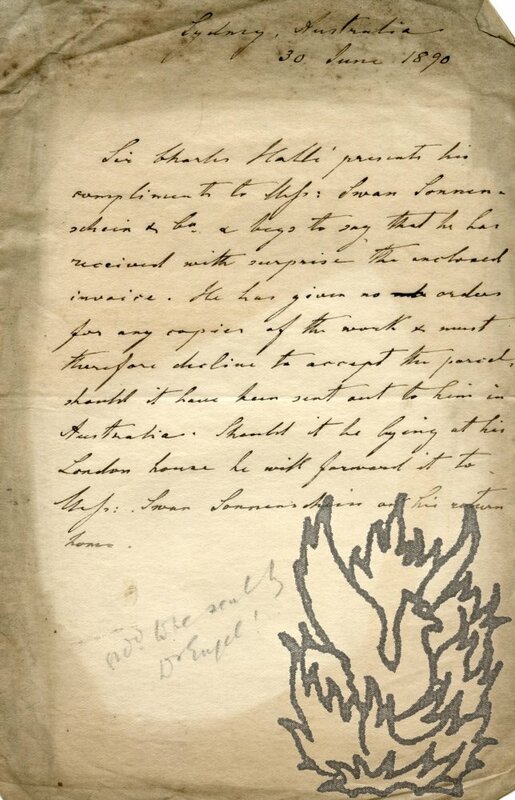 Yarrell was the first to describe the Bewick Swan (1830), and name it after his friend, Thomas Bewick. Presumably it is now the subject of a learned contribution to the Journal of the Zoological Society. Autograph Card Signed ('Marshall P. Wilder') to the English publisher [William Swan] Sonnenschein (1855-1934). 19 August 1889; on Marshall's letterhead from 'The Alpine', 55 West 33rd. Street, New York. 8.5 x 11 cms. Grubby and lightly spotted. Reads 'My dear Mr Sonnenschein | Kindly send draft as I can collect here - | Merrily Yours | Marshall P. Wilder'. Presumably refers to the English printing of his 'The people I've smiled with: recollections of a merry little life' (1889).